Note: This hand is now part of a huge collection of "Giant Hands Around The World". 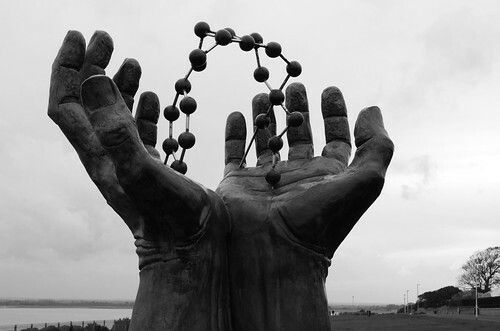 The collection contains 170+ hand sculptures. 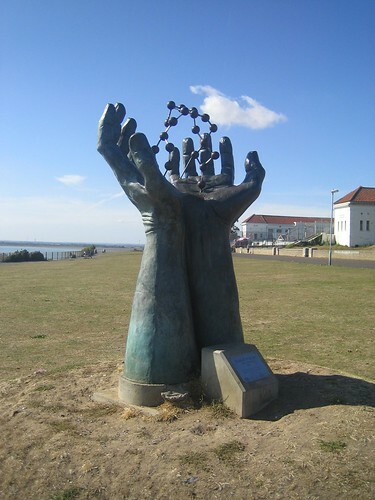 This pair of giant hands holding up strings of molecules called "Hands & Molecule" is located on the Westcliff Promenade, Ramsgate, Kent, UK. It was commissioned by Sustrans (A leading UK charity enabling people to travel by foot, bike or public transport) and sponsored by pharmaceutical company Pfizer. The 2.4 meters (8 ft) high sculpture was designed by David Barnes, with bronze casting by Livingstone Art Founders and was unveiled in June 2000 to mark the opening of the National Cycle Network (Route 15) in Thanet, Kent.